SouthernLiving.com named PinPoint Restaurant, located in Wilmington&apos;s River District, among their picks for Best New Restaurants of 2016. 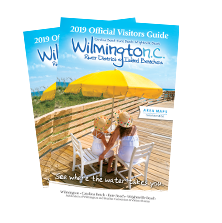 USA TODAY 10Best Reader’s Choice travel awards voted Wilmington, NC as the #1 Best Al Fresco Dining Neighborhood. Manna restaurant received its second consecutive AAA 4-diamond rating in 2016. Coastal Living named Shuckin Shack one of the Best Seafood Dives in America. Scoutology.com included three Wilmington & Beaches eateries—manna, Rx and 21 North on its list of 21 Top 21 N.C. New American Restaurants. Fourteen of Wilmington&apos;s food trucks were noted as wonderfully complementing the recent influx of micro-breweries, keeping drinkers full and happy in a city ranked number seven on SmartAsset.com&apos;s Best Cities for Beer Drinkers. Thrillist.com included Flaming Amy’s Burrito Barn (locations in Wilmington and Carolina Beach) among its list of 33 Best Burritos in America. Our State magazine included Carolina Beach&apos;s Surf House as one of the 5 Farm to Table Restaurants to Visit in NC.